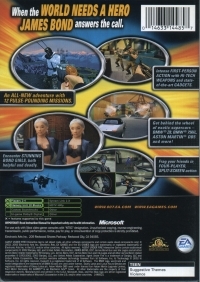 Description: Note: This game is NOT supported by Xbox 360 backwards compatibility. 03-13-2016 lugnut Description Note: This game is NOT supported by Xbox 360 backwards compatibility. 03-13-2016 lugnut Box Text When The World Needs A Hero James Bond Answers The Call * An all-new adventure with 12 pulse-pounding missions. * Intense first-person action with hi-tech weapons and state-of-the-art gadgets. * Encounter stunning Bond Girls, both beautiful and deadly. * Get behind the wheel of exotic supercars BMW Z8, BMW 720iL, Aston-Martin DB5 and more! * Frag your friends in four-player split-screen action. 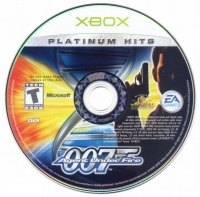 This is a list of VGCollect users who have 007: Agent Under Fire - Platinum Hits in their Collection. 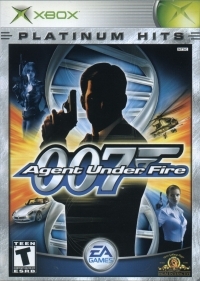 This is a list of VGCollect users who have 007: Agent Under Fire - Platinum Hits in their Sell List. This is a list of VGCollect users who have 007: Agent Under Fire - Platinum Hits in their Wish List.